Ward did an excellent write up on a bunch of wine aerators he tested. All of the aerators he tested worked by pouring the wine through a contraption that would basically mix up the wine with the ambient air. Ted from True Taste Wine Aerator sent us a sample of his aeration system that works by using a pump to actually bubble air directly into the wine. 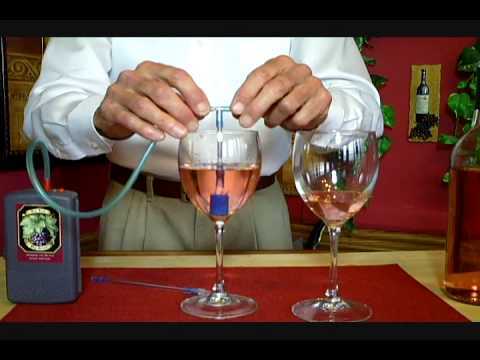 In theory this will let you control exactly how much air you put into the wine. I’ve only used it once so far, on a bottle of cheap $10 Arrogant Frog Lily Pad Pinot Noir, but the results were pretty spectacular. Although cheap, this wine was a good candidate for aeration because it was a little strong on the alcohol straight from the bottle. I used the True Taste to aerate directly inside the glass for 5-8 seconds and there was a noticeable difference in the quality and texture of the wine. The wine was mellowed as if it had been sitting out for an hour or more. And you could taste another level of flavors. Vinturi Essential Wine Aerator tonight.) I’m excited to try this on some other wines to get a better feel for it. The construction is very home-made (there is an extra battery slot that you need to leave empty that could be confusing). The tubing looks medical grade. There are a few pieces you need to squeeze together. It can look intimidating at first, but everything is easy to put together and clean up once you use it. I found the box more visually appealing than the pump itself. Which is good because there are a few parts and you’ll need something to store them in. If, like me, you don’t have any more cabinet space, you’ll need to store it in the open. The box with the True Taste logo on top looks nice on top of our wine fridge. Now you are going to look like a total nerd whipping this out at a party. But I always thought that the fancy glass pour-through systems looked a little pretentious… making you look like a wine snob. Wine nerd. Wine snob. Your choice. Maybe do the aeration ahead of time to avoid it. Here’s an instructional video from the True Taste website. It will give you a good feel for how the device works. 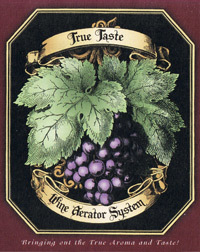 The True Taste Wine Aerator System is $39.95 at their website. That’s some decent cash to put down for a device like this, but I think it’s worth it. I could see myself spending a bit of my wine money on something that would make all the wine I drink taste better vs. splurging for a nicer bottle. So I’m sold on aerating. What I’m unsure of is if this is the best way to go about it. I suppose you could save money and decant it in advance, although decanters can get up there in price too and you do have to plan ahead a bit. And it’s possible other aeration systems are better. Again, I’m going to try the True Taste against the Vinturi, and will probably decant some for comparison. I’ll let you know how that goes. Chime in if you have a favorite aeration system or trick.